From May 28th to 30th, the 12th UN Vesak Day celebration was held in the biggest Bukkyo University of the world – Thailand’s Mahachulalongkorn Buddhist University. PanJiwen, the UNSG and Irina, the Director-General of UNESCO sent congratulations. Xuecheng mage, the chairman of the Chinese Buddhist Association were invited to take part. YiYang, the director of news service in China State Bureau of Religious Affairs, LinZhizhi, the deputy director of Fujian Bureau of Religious Affairs, and RaoChungui, the deputy director of Fuzhou Religious Affairs Office all witness it. As the provider of “Mahachulalongkorn Buddhist University Informatization Mobile Internet Solution”, NetDragon Websoft Inc. participated in this event together. 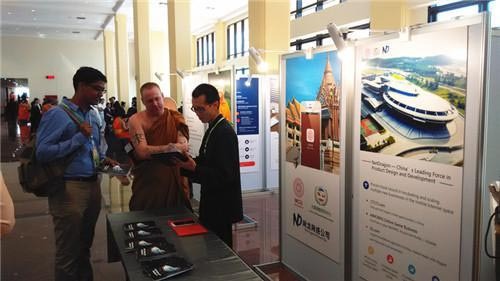 In the event, more than 30 thousand representatives from 86 countries and regions all over the world showed a big interested in the Buddhism Knowledge and Buddhism Knowledge Solution shown by NetDragon, and the brochures made for this event were all taken rapidly. During the event, Most Ven. Prof. Dr. Phra Brahmpundit had a meeting with Liang Nianjian, the vice chairman of NetDragon and ZhengHui, the executive director of NetDragon. Liang Nianjian formally handed in the Mobile Informatization Solution to Most Ven. Prof. Dr. Phra Brahmpundit. First held in May, 2004, “UN Vesak Day” Global Buddhist Congregation has been held by Mahachulalongkorn Buddhist University for 12 years. Vesak Day is now becoming a platform for the Buddhist leaders and Buddhists to show the development of Buddhism in their countries to the world. It’s also becoming a stage for the Buddhists to solve international conflicts from a Buddhist perspective and give suggestions to improve global harmonious development. 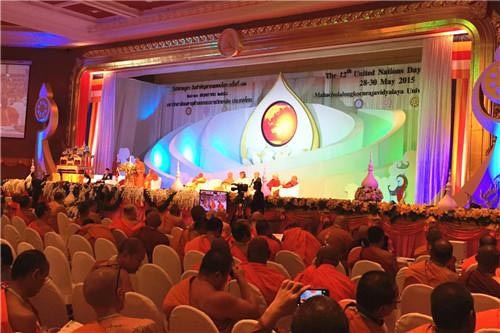 It’s reported that the subject of the Vesak Day this year is “Buddhism and the World Crisis”, attracting more than 30 thousand representatives from 86 countries and regions all over the world attend the conference. 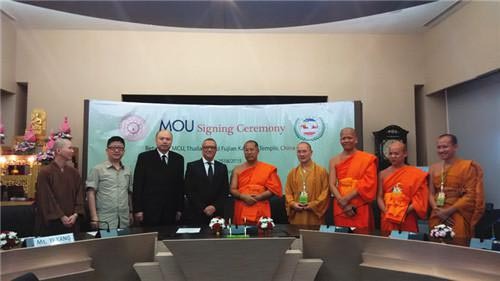 In the morning of May 28th, the conference was opened in the main campus of MCU with the King of Thailand monk, Thailand’s crown prince and committee of Vesak Day attended. As the leader in Chinese mobile internet application realm, NetDragon attended this Vesak Day with its “Buddhism Knowledge Informatization Solution”. 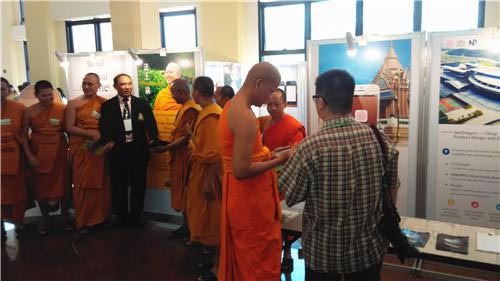 The exhibition of Buddhism Informatization made by NetDragon has attracted enthusiastic attention of the representatives, and the brochures made for this event were all taken rapidly. NetDragon Buddhism Knowledge Informatization Solution is going to build a One-Stop Service Platform for Buddhism Informatization through the power of science and network technology. Meanwhile, it will integrate the modern technology into Buddhism and to promote it with new concept of life, so that to help Buddhists publicize the power of Buddha, promote charity and develop the culture of Buddhism. What’s more, a Buddhism Informatization seminar was specially held during the Vesak Day this year with “Buddhism Knowledge” execute solution formally adopted.